For a few years now, I hatch my fry during winter in a small incubator with a Peltier element, kept at 22 degrees inside. It works really well, so that I even leave the fish in for a few weeks while they are fed with Daphnia and Artemia. So the fry swim in between other boxes and bags with eggs in a moderate amount of light. These boxes and bags around them are the really crucial ones at times. 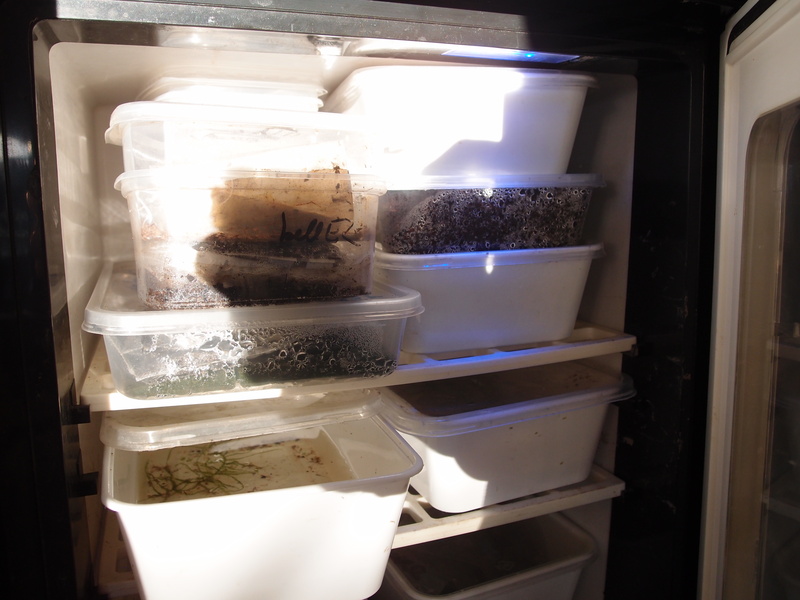 When I store peat on the shelves in the room or garden, hatching becomes less predictable than when I store the eggs in an incubator. So I try to behave in a safe manner now and store – per line – one box with lots of eggs in an incubator. I need to hatch it then after some four to five months. I tried to maintain lines just on the basis of boxes stored at less controlled temperatures, but that turns out to be tricky sometimes and with some risk if eggs need to be stored for long. Some additional certainty is comforting and the incubator as a back-up is taking little space. In there now, swimming happily: A. viarius (Valisas). This entry was posted in Incubation, Maintenance by tvdooren. Bookmark the permalink.